There are still those who think he was a myth, which is not so surprising considering the many ways he has been depicted in our folklore—and considering the crazy way he chose to live. He was an early proponent of pacifism, simple living, animal rights, and even plant rights. He helped early homesteaders lay claim to a lot of our country’s best farmland. For John Chapman, though he was an itinerant preacher and a land speculator, it was all about nature, and nature was all about the apples. Chapman was born in 1772. His father fought in the Revolutionary War at the Battle of Bunker Hill and served under General George Washington. His mother died soon after the birth of her third child, leaving only John and his sister Elizabeth, but his father found a new wife after the war and produced 10 half-siblings. John stayed around home long enough to learn some skills from a local orchardist, and then, at age 18, maybe feeling a bit crowded, he began a lifetime of peregrination that, remarkably, combined travel with the love of apples and the soil they grew in. He would never settle anywhere again. It’s not possible to precisely follow Chapman on a map. He simply didn’t keep to anyone’s expectations or anyone’s schedule and made no written records, though he must have had a highly organized brain because he planted apple seedlings wherever he went and came back to check on them on a regular basis. One thing seems pretty certain. By the time he was in his early 30s, people were calling him Johnny Appleseed. Here’s what Johnny (we’ll call him that now, as that is the name and the persona he created, adapted to, and is almost always known by) didn’t do: he didn’t scatter apple seeds hither and thither, or plant a tree here, another one there. He didn’t graft apples trees. And, like just about everyone in America at that time, he didn’t eat apples. What he did was surprisingly well-planned, considering his roving ways. He started apple tree nurseries. And he revisited them. And he bought or acquired, and sold or speculated on the land where he had nurseries. And all on his own without anyone asking him to, he promoted and encouraged homesteading throughout the newly opening country. Johnny’s respect for life prevented him from grafting apple trees. Some say that the idea of hurting them by digging a knife in their flesh was against the principles of the particular Christian sect he adhered to. Yet he did have to cut trees to make fences, and he trimmed his apple trees to keep them in uniform shape, according to at least one observer. Another theory is that he considered grafting an interference in natural processes—that God and Mother Nature knew best what kinds of apples the earth needed. Whichever the case, he did not graft the trees but grew all of “his” trees from seed. Johnny got big bags of apple seeds from the residue of cider presses. He didn’t eat apples because nobody did; apples were for cider. Hard cider. Water, in those days, was likely to be polluted, but cider was safe. Men, women, and children all drank hard cider. By Johnny’s time, it was already an ancient quaff, a holdover from Roman times. Leave picked apples alone and they will ferment. Cider was a sour thirst quencher as well as a medicine, believed to prevent cholera, dysentery, and typhoid. So Johnny took the seeds of this medicinal plant and planted them in very highly organized nurseries. At the time in Ohio, 100-acre homesteading parcels could be “proved” by anyone who planted fifty apple trees and 20 peach trees and tended them for three years. Johnny, so legend and lore have it (since there are almost no records of these transactions), would scoop up acreage, plant the trees, tend them for the requisite time, and then sell the homesteads at some profit. Or give them away. Or give the trees away. Or whatever he felt like doing at the time. Because in performing these tasks, Johnny was not trying to build up an earthly estate. Far from it. 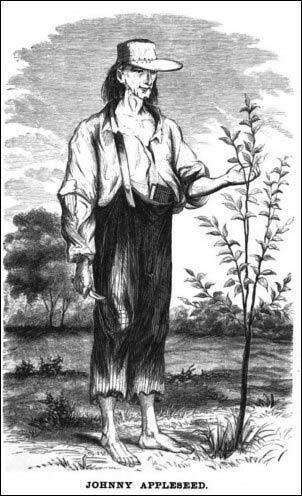 One of the hallmarks of the legendary Johnny Appleseed was his generosity. He often gave his trees away, gave his land away at times, and even gave away his clothing, though he wore such a hodge-podge of rags that it’s hard to imagine anyone would be poor enough to need them. He wore, it was said, a pot lid for a hat, under which he kept his apple seeds. There were no photographs at the time, so this will never be confirmed. It was known that when traveling, he slept on the ground, and if invited into a home, slept on the floor. Johnny Appleseed was said to have such respect for all life that he once doused his little campfire when he saw that mosquitoes were perishing in it. Another story has it that he moved away from a mother bear and her cub, leaving her the warm place by the fire while he dozed in the snow. The sun, the rain, and the apple seed. Being seen as a Disney cartoon probably contributed to the belief that Johnny wasn’t real, any more than Snow White or Mickey Mouse or Goofy. But he was real enough to be remembered and written about everywhere he went. He planted trees in northern West Virginia, all over Ohio, Illinois, Pennsylvania, and Indiana, and even up in Ontario. By letting the seeds decide what to do, letting them play with the local butterflies and grow in local conditions, Johnny was, knowingly or un, making new apples for the new nation. We will never know which new varieties emerged from his dedication, but we do know that left alone, plants will evolve to suit their conditions. 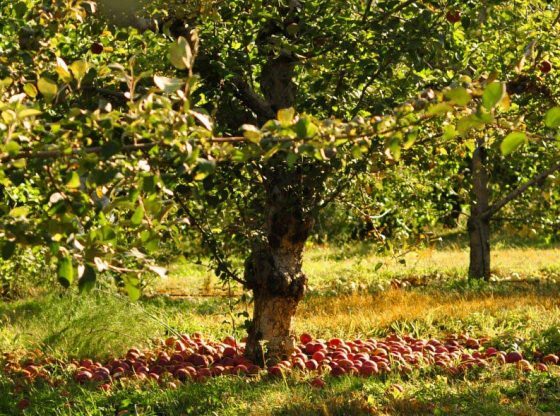 And of course, his trees were all useful, because the apples were used for livestock feed and cider production. It can be argued that he promoted wide-ranging early homesteading, making it easier for folks to prove up their claims by starting healthy orchards for them. Johnny’s lore slowly spread through the Midwest. He ate only honey, berries, and—when he could get milk—cornmeal mush. He used herbal remedies. He couldn’t stand to see animals suffer, and more than once gave his hard-earned money to have a horse boarded in decent conditions instead of being left to suffer in harsh weather. He even famously bought a dying, doomed horse and paid to put it in a grassy pasture where it recovered its health. 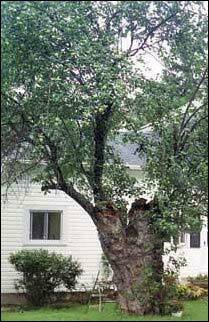 The last known surviving apple tree planted by Johnny Appleseed was traced to Nova, Ohio in 1994. Johnny passed away at the age of 71 while visiting with some folks in a cabin somewhere in northern Indiana, within a few hours after taking sick. It was said that his expression was placid in death. There is as little substantiation for the story of his death (and as much confusion) as about his unconventional life. One thing seems certain: his lifestyle was healthy, since the average lifespan for the time was about 40. He never married, perhaps because he believed that enjoyment of earthly pleasures would imperil his chances of enjoying heavenly ones. Though he could have, he never settled down to enjoy any of his property, leaving 1,200 acres to his sister Elizabeth. Johnny brought thousands of trees to life; he probably nursed about 300,000 seedlings (15,000 of his trees grew in Allen County, Indiana alone). A handful of trees remain that are said to have been planted by his hand, but this can’t be authenticated and is unlikely, since even standard, non-hybrid trees rarely live to be as old as 100. One reason why the Johnny Appleseed trees disappeared has nothing to do with old age, change of land usage, or the ravages of violent weather—that reason is Prohibition. Yes, the federal agents charged with ridding America of demon rum between 1920 and 1933 also attacked the trees that bore the spittingly bitter apples so beloved of cider millers. It’s hard to know whether a modern version of Johnny Appleseed would applaud their actions on moral grounds. But I personally suspect that if Johnny could have spoken from the grave, he would have decried their actions as plain murder; rendering death to one of God’s noblest creations. Johnny’s birthday, September 26, is celebrated in some places, and in other places his March 11 passing is noted since it marks planting season. There are parks and museums that bear his name. 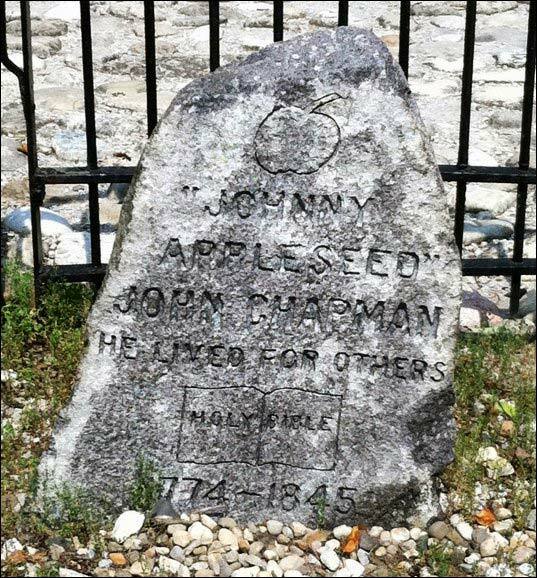 Though he was a real person, and not a Disney dream, John Chapman/Johnny Appleseed remains a puzzle, but a revered one. Many people have speculated that his journeys were a sort of never-ending pilgrimage, that he was seeking the Promised Land… or had found it and never really left it.